Sacked for a Snack and Dr Clark’s Response! 1. Dr Clark stated words to the effect that workplace health and safety has been her number one priority since commencing in the top position. The Victim’s note that Dr Clark has been in her current position for quite some time but contrary to Dr Clark’s assertions, the level of bullying, harassment and victimisation has continued to flourish under her leadership, and in fact a recent Comcare investigation into the bullying complaints of a former employee, Dr Clark herself was implicated to no small degree in the perpetuation of the victimisation of the former employee. Despite Dr Clark’s assertions that she is all about “Zero Tolerance” to workplace bullying and pro-workplace health and safety, she has continually attempted to dodge questions raised by our politician’s in relation to concerns about CSIRO’s workplace health and safety track record. The sparse responses which have been elicited from Dr Clark have been somewhat effusive, unnecessarily-qualified and have been lacking in any real substance. Dr Clark and members of the CSIRO Executive Management Team have been caught out misleading the parliament on numerous occasions and have demonstrated that unless significant pressure is brought to bear, the CSIRO’s senior leadership will continue to sweep the issue under the carpet. There is “Zero” transparency in the CSIRO handling of its workplace health and safety issues. Dr Clark’s recent communications have been full of aspirations with no real demonstrative action despite Dr Clark having become acquainted with many of these issues early on in her appointment. A summary of the story in written form taken from Today Tonight’s website is posted below for convenience. In a workplace dispute that’s hard to swallow, a man has lost his job for taking a detour on the way home to go through a McDonald’s drive-through. A man has lost his job for taking a detour on the way home to go through a McDonald’s drive-through. The fast food drive through for a hungry worker ultimately led to a fast dismissal, of a man who claims that buying a burger cost him his dream job. Jack Hoffman is an electronic technician with the CSIRO and has worked with the premier science organisation for the past ten years. For the past three he’s been involved in space exploration at the CSIRO’s Deep Space Communications Complex south of Canberra – working with NASA on cutting-edge space projects. “I was directly involved in the missions to planets like Mars and Jupiter, and to other planets, so I felt I was doing something important and very valuable for humanity,” Hoffman said.Because the site is 25 kilometres from Canberra, NASA provides a fleet of pool vehicles for the CSIRO workers to drive from home and back. However there are strict rules in place for how the cars can be used. “We’re not supposed to use the cars privately, and they accused me of using a car privately by taking it off the road and going through a drive-through,” Hoffman said. 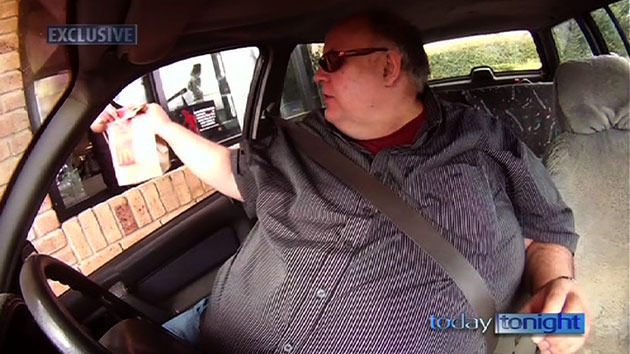 In May this year, not having eaten all day, Hoffman was driving home when he pulled into a McDonald’s near his house. He had deviated about 50 metres from his route home. “I was gone for that. Had I not done that, I would still be working there,” he said. Juliar Gillard’s carbon tax is cminog up in a couple of months. She needs all the support she can get.The director of the C.S.I.R.O was all over the MSM today spouting nonsense with this report. Juliar popped up just after trumpeting justification for her carbon tax.